March | 2016 | Footwear Fashionista … a sneak peek into my shoe closet! And the award should go to …. 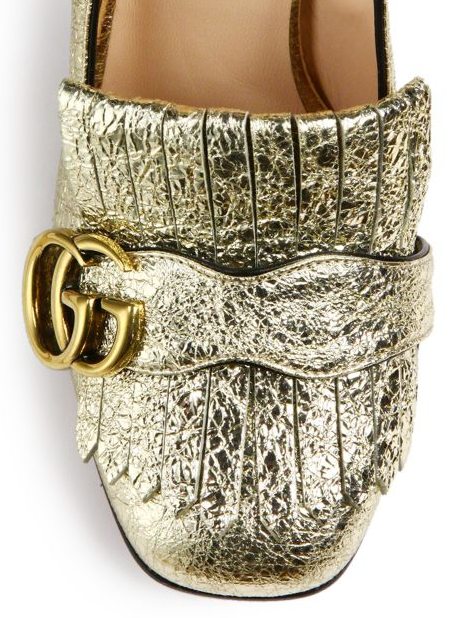 the “Marmont GG” metallic leather pumps by Gucci. These were first seen at the SS16 runway show and since I couldn’t find them in stores, I had to order online. A few clicks and an online coupon to save a few bucks, and they were on their way to my doorstep. I really just wanted to see the gold-platinum cracked-leather material. I hadn’t planned to fall in love with them. 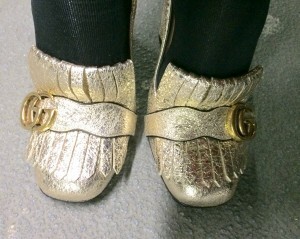 These shoes … make me smile. The 4″ heel looks high but since its a block heel, it’s quite comfortable. 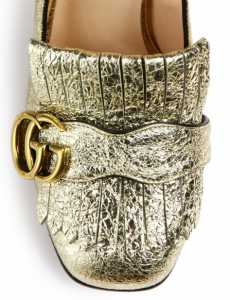 They also come in a much lower, 1″ loafer style heel, but with shoes this stunning, give me the height. 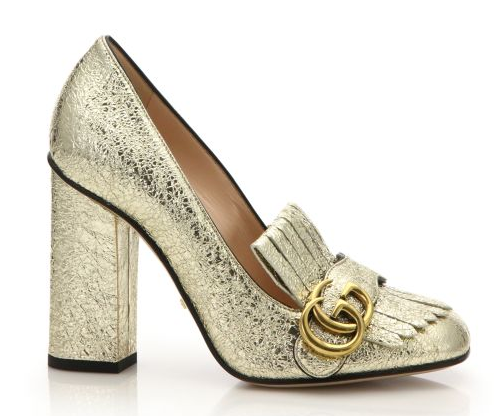 These stylish pumps have a vintage look with a fringed front panel and square-toed shape. The gold-tone metal GG plaque pairs nicely with the cracked metallic leather. Black leather piping helps ground the look. These beauties really are worth their weight in gold.